Phrobs are in! – Beer! I’ve been working the last few months on learning KiCad which is open source eCad software with an abyssmal user interface. But I’ve managed to layout my first two boards. 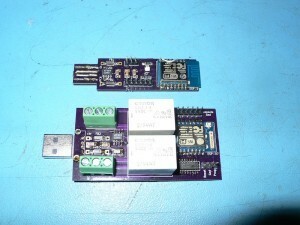 Both are based on the ESP-8266. My first board has an SI7020 temperature/humidity chip. My second board has a couple of 16A relays on it (though the traces only support about 5A for now). Both boards are a ‘rev 1’ so a couple things need to be cleaned up for Rev 2.
mosquitto_pub -t "RelayPhrob1/gpio/5" -m "1"
$ mosquitto_pub -t "RelayPhrob1/gpio/5" -m "0"
Next I will simply add an MQTT plugin to my Phrob ecosphere and I will be relatively self sufficient.